This Fashion Revolution Week it's time to celebrate all the amazing local designers and makers setting the new standard in transparent, responsible business. Here's how you can continue a Fashion Revolution after the week's over. 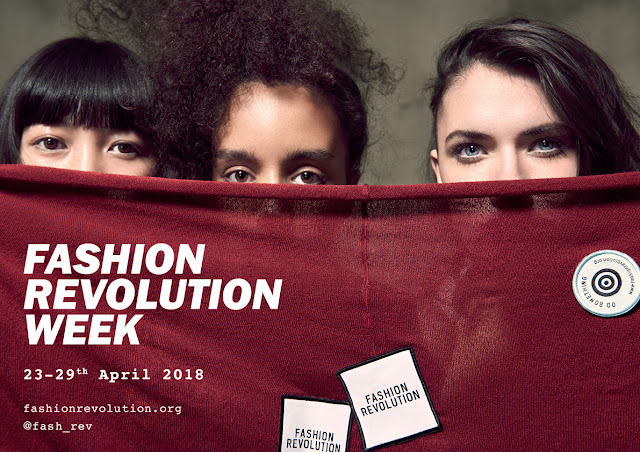 Each year when Fashion Revolution Week sweeps the world, we're reminded of the horrific Rana Plaza collapse in Bangladesh that killed more than 1100 garment workers on 24 April, 2013. This is the day the global Fashion Revolution movement was born. I believe we can, will and already are seeing massive change in the fashion industry - it's about people power. Here's how you can get involved and create your own Fashion Revolution. Me with my vintage tag out! You'll see many people asking #Whomademyclothes this week. We should all stay curious about this! The idea is we see brands, makers and producers responding with #Imadeyourclothes in a show of transparency. Wear your favourite outfit - showing the tags! - take a photo and tag that brand on social media, asking "Who made my clothes?" I'd love to hear what response you get. Read: How transparent are the 150 largest fashion brands? It's the first step to a fair fashion industry - if brands are happy with what they are doing, how they are treating workers and the environment, then they should be happy to share that with us, their consumers. And if they're not, it's time they figured out what happened in their supply chains and made responsible business decisions. Want to know how the 150 largest fashion brands stack up? Check out Fashion Revolution's Fashion Transparency Index 2018. Keith of Lochcarron of Scotland - he's a weaver! There are so many brands and makers doing things ethically - the list is only growing! Show you support this way of doing business and choose brands that match your values. Not sure where to start (other than this blog of course!)? Check out the newly-launched The Kind Guide for more ethical brands than you'll ever need! Founder Samee Lapham has made it super easy to shop your values, with a handy filter for categories including charitable, upcycled, minimal waste, vegan, organic and more. Download the Good On You app for next time you need to choose between brands. Shop directly via Well Made Clothes and check out their cleverly-defined values too. Buy things already in rotation. I now see my wardrobe as a rotation device. No really. I buy mostly second-hand (and that's not just clothes), and then when a refresh is due I donate them, sell them or give them away and keep the cycle going. Look out for good labels, high quality fabrics and staple items you will get a lot of wear out of. Keep it going: Check out my guide to shopping second hand first and my tips on getting thrifty.